Ever encountered a post that hashtags every other word? Not only is this annoying to read, but the post itself is not visually appealing. This terrible habit will send users scrolling right on by your post. The problem is that not many people know how to use hashtags correctly, which can then lead to an overload use of hashtags. There seems to be a need to hashtag every subject. This causes irrelevant and distracting conversations. My dear friends Jimmy Fallon and Justin Timberlake perfectly exemplified how Twitter would sound like if each post was verbalized in the video above. Hashtags are important tools to get your message across, and to the right audience. The idea behind a hashtag is to create a trending topic within your post. Your posts should be clear and concise, and attractive enough to read. So the next time you catch yourself hashtagging a word, ask yourself, “What is my message?” Hashtags are your assets, not your enemy! Have you ever caught yourself checking your social media accounts right before you go to sleep and right after you wake up in the morning? What about, when you post a new profile picture or a status update, do you count the amount of “likes” it receives per hour? Going social overboard does not necessary mean posting too often, but also the desire to check our notifications constantly. I admit there are times where I lay in bed at night with the light from my phone shining in my face. The temptation to put my phone back on my nightstand is too great. It’s important to acknowledge the fact that we need to find a limit of when to turn off our smart phones, and just…BREATHE. Don’t worry about missing anything on social media. Keep in mind: It’ll still be there the next day. Don’t consume yourself in social overload the moment you go to sleep or the minute your alarm goes off in the morning. One of the best ways to combat constant social media monitoring is to disable push notifications to your phone. No alerts every time someone likes your dog’s birthday party pictures will allow you to keep a clearer mind and concentrate on whatever may be at hand. Does it seem like time is wasted when we’ve been on the computer for too long? There are times when I could be on Facebook for five hours and not know it. 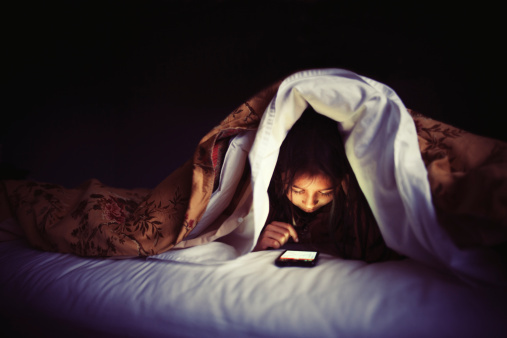 (Forget about hiding under the covers with our phones at night. Admit it we have all looked like Penny some way or another once in our lives during the day!) How do we even communicate without social media? – Photos are shared, posts are retweeted, and life moments are snapped. Social overload occurs when we cannot differentiate the outside world from the digital world. Conversations occur when we comment on a friend’s status and/or a photo. But, what about just sending a normal a text message or a phone call to a friend? Social media has influenced us to “stay connected” that we seem to forget how to communicate outside this medium. It’s time to take a break and not let social media control your social life. Going overboard with posting photos on Instagram can be a turn off, especially when taking way too many selfies. (The selfie stick was invented…what?! President Obama hilariously shows us a parody of how it’s done.) Instagram is a visual platform – we like what we see, it’s just that simple. So when I scroll through an account – personal, a company, or a well-known personality – I do not want to see endless selfies and uninspiring images. In other words, taking selfies do not showcase your brand. Content should be diverse and creative to attract viewers to follow your account. The Wet Brush Instagram account is the perfect example that utilizes diverse content to get their brand across target audiences – product items, selfies with a Wet Brush, quotes, beauty tips, and girl humor. Instead of an overload of selfies and pointless content, capture and share images that are valued. Instagram can be described as a lifestyle album. Therefore, create your account to be unique that matches your brand and style. Social media has become embedded in our culture that we are so attached to the online addiction. However, just remember to take a break from social media once and a while. Don’t go overboard posting too often or checking for updates. Social media isn’t going anywhere anytime soon. There’s plenty of time to perfect your craft.